What is the Royal Commission into Child Sexual Abuse actually trying to achieve? The allegations that have come to light recently about child sexual abuse have been heartbreaking. These are insidious, evil acts to which no child should be subject. I believe we must do everything we can to make sure that what has happened in the past is never allowed to happen again. Julia Gillard’s words go a long way towards describing the most important reason for the Royal Commission into Institutional Responses to Child Sexual Abuse. We need to stop the horrific atrocities from affecting the next generations of Australians. We need to do whatever we can to avoid the injustices of the past. We need to hold those responsible to account. With all of the media coverage and public interest, the Royal Commission has developed a high profile. But for those of us with a vested interest in proceedings, it is sometimes hard to understand the outcomes the Commission is trying to achieve. For many victims unsure whether or not they can or should give evidence, we’ve set out to explain the purpose of the Royal Commission in simple terms. We answer some of the most common questions that victims ask to help them determine whether or not to give evidence. What is the Royal Commission’s role? The Commission is attempting to identify common, serious mistakes that Australian institutions have made in the past that have led to children in their care being sexually abused. It will make recommendations about how laws, policies and practices can be improved, to make sure institutions and governments do not fail children in the same way again. The Commission will investigate how institutions can better protect children from sexual abuse and how abuse can be prevented. It will explore what can be done to encourage the reporting of abuse and how to ensure that all allegations are investigated appropriately. Will the Commission be able to influence victim’s compensation? It is not the Royal Commission’s role to achieve compensation for individual victims, but it will make recommendations about how justice can be best achieved. Many experts believe this will include suggestions that victims receive appropriate financial compensation. Even if you received some sort or compensation in the past, you would be able to receive a new, fair level of compensation, regardless of any non-disclosure clause you may have signed. We can help you with this next stage in the process, once the Royal Commission has heard your evidence. What stories does the Royal Commission need? The Royal Commission needs to hear from people who were sexually abused as children while in the care of private organisations, such as churches, or public organisations run by commonwealth, state or territory governments. Those institutions might have been providing child-care, accommodation, education and training, or cultural or sporting opportunities. Abusers may have been teachers, scout leaders, priests, or carers. The Royal Commission is only investigating sexual abuse, not physical or emotional abuse. It is not investigating sexual abuse that occurred within families or outside of an institutional context. The success of the work that we do is of course dependent upon people coming to us to share their story. If you have any information that you think might help the Royal Commission in its quest for justice – now is the time to act. The Commission is still calling for victims and witnesses to give evidence. If you’re thinking about it, tell us your story and we’ll help you through the process. 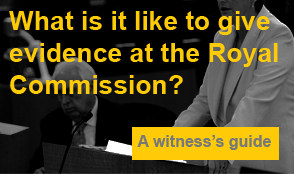 If you’re still unsure, have a read through our guide to find out what it’s like to be a witness at the Royal Commission. This will help you understand what to expect as you take the next step. If you’re ready and you want to move forward with your evidence, make sure you tell us your story and we’ll help you start on your journey for justice.